There are far worse companies out there than Goassignmenthelp.com.au. It is just that Goassignmenthelp.com.au will not knock your socks off. Their prices are slightly on the high side, but they are fair, and they do not take on projects that they cannot complete. They tell a few lies on their website, such as where they are located and how many people they have working for them, but quite a few essay writing services pretend they are bigger than they are. In truth, the work you get from Goassignmenthelp.com.au is passable, but it isn’t great, which means you shouldn’t use the company if you are looking for anything more than a pass. 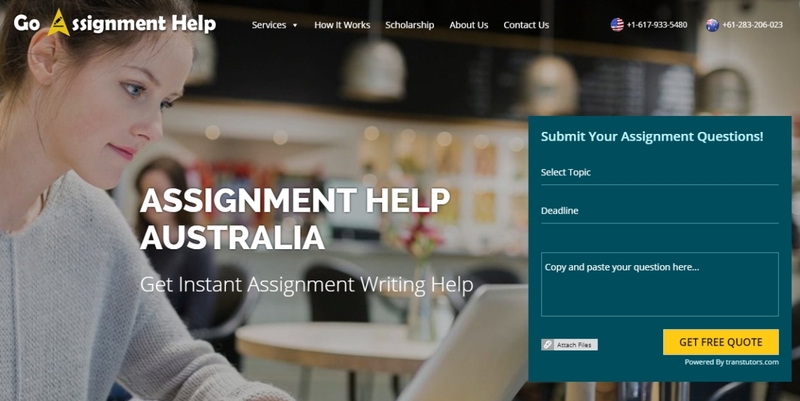 Your professor will probably ask for amendments to get your mark/score up a little, and Goassignmenthelp.com.au will complete your amendments up to a point, but if it looks like your amendments will push your grade/mark up above a pass, then the writers may ask for more money. Their base price is $17.95 per page, and each page is 275 words long. However, do not be fooled by this price because they are going to start making claims that they will beat any price you send to them. That is when you start going around all the other essay writing services and getting cheaper quotes. You may then bully the Goassignmenthelp.com.au writers into prices as low as $10 per page. They have a 20% discount advertised on their website, which is supposed to be for people who are making their second or third order. You can bully the team into giving you a larger discount by claiming you got better prices and discounts from other companies. Goassignmenthelp.com.au lists their services and then tries to describe them on their website, but they do not do a very good job. In short, they will complete your management assignment, accounting, finance, programming and statistics assignment. They will work on your nursing paper, engineering, economics and law paper. They will also complete your high school homework if required. If you stick around on their website long enough, you will see the live Chat function come up. It will tell you that they have 300+ experts online, at which point you can harass the live chatter by asking her to name them. And, if stick around even longer, it will say that you can get 30% off your first order if you use the code “HOMETT” when you make your first order. The company uses the term, “Free of cost” quite often, but what they offer should be free anyway. For example, they say you can talk to a sales agent free of cost and you can update your instructions free of cost. The live chat function enables you to make contact with the company 24×7. We tried the phone lines after business hours and the automated machine told us to use the website to request a call back. There is a widget on the website where you may enter your phone number and the company will call you back. You may send a message via the message function on their “Contact Us” page, and you will get the same response as if you email them. If you send a message or email them, then you get a reply the next morning where a human answers your questions. You may try visiting their address, but all we found was a bunch of empty offices and a bunch of offices with military personnel in them.